"Sketching the Soul" is currently being staged at MuCCC and will continue this weekend. Presented by hummingbird theater co. The existence of MuCCC, a church-turned-arts venue, enables many small performance groups with a script and a dream to produce theatrical works. And while it's important to support and encourage this kind of community theater, it's equally as important for the troupes to reward audience members with a quality night out -- especially if there's a charge for the show. Through March 25, hummingbird theater co. -- formerly BART Productions -- is staging "Sketching the Soul," a 1989 play by Jacqueline Lynch. The show is directed by Don Bartalo, one of MuCCC's 2017 artists-in-residence and the current president of the Penfield Players. It's the story of Chelsea Logan (played by Sara Penner), a young painter who's just caught her first big break. As the show begins, she's returning home to New York City from a successful gallery showing in San Francisco. That's when her past literally comes knocking. Logan grew up Amish, and when her sister, Sarah Richter (Laura Thompson Pratt), shows up at her door in full Amish dress, her past is no longer a secret to her boyfriend, lawyer Mike Grimaldi (Brian Tan), and her friend and neighbor, Nancy (Stephanie Sheak). Add to that an interview with pushy magazine journalist Maureen Nash (Denise Bartalo), and Logan begins to question everything she once thought she wanted. When there is a relatively small cast, a few things can happen. It's true the players may have more opportunity to shine both individually and as an ensemble; but it's also true that just one weak cast member can easily dilute the ensemble. "Sketching the Soul" has a little of both. In general, the biggest issue is the tone throughout the play. Penner keeps a frenetic pace that doesn't allow for the power of Lynch's well-written dialogue to take hold and affect the audience. The level Penner sustains in both vocal inflection and tension elevates each scene to a level of stress that is hard to understand, and it's established right at the beginning of the show. (Even during intermission, audience members whispered back and forth about their confusion as to why Penner and Tan's characters were at odds as soon as the play began.) There was no established relationship, no context to help the audience understand where the stress was coming from. Arguably, this could be less the fault of the actors and more a misstep in the direction of the show -- but as a result, any sort of romantic relationship between the two characters is hard to believe. When Nancy enters, it's a welcome break from the one note scene between Tan and Penner. Sheak is clearly an experienced actor, and one who has a significant stage presence. Her character's attitude and Long Island accent add depth to each scene (as well as comic relief); she's a "three-dimensional character" when most of the others seem to be playing caricatures. Another commendable cast member is Pratt as Logan's meek Amish sister Sarah. Thompson never seems as though being onstage unsettles her, rather, she's fully in character the whole time: watching her fellow cast members, responding to them, and giving them emotion to play off in return. Perhaps for this reason, Penner and Tan's individual scenes with Thompson are their best in the show. As Maureen Nash, Denise Bartalo pleasingly plays the reporter, but Joseph Barcia's portrayal of photographer Arthur Coakley is overplayed to distraction. "Sketching the Soul" is set in 1989, so it's to be assumed that the decor is questionable, and the set reflected that. The most confusing part of the show's aesthetic was a projected slideshow of paintings that looped on a screen before the play began. Based on the accompanying watermarks, the collection appeared to be plucked right from a Google search of "Amish country paintings." However, as a watermark represents a copyright, it would have been wise to obtain permission (and watermark-free files) from the painters before including their work in the production. There was another odd addition at the top of the show and again right after intermission when singer Mary Wojciechowski -- who didn't appear in the rest of the play -- entered in a long, white Grecian dress and sang an a cappella gospel tune. The symbolism was muddling, but Wojciechowski does have a lovely voice. 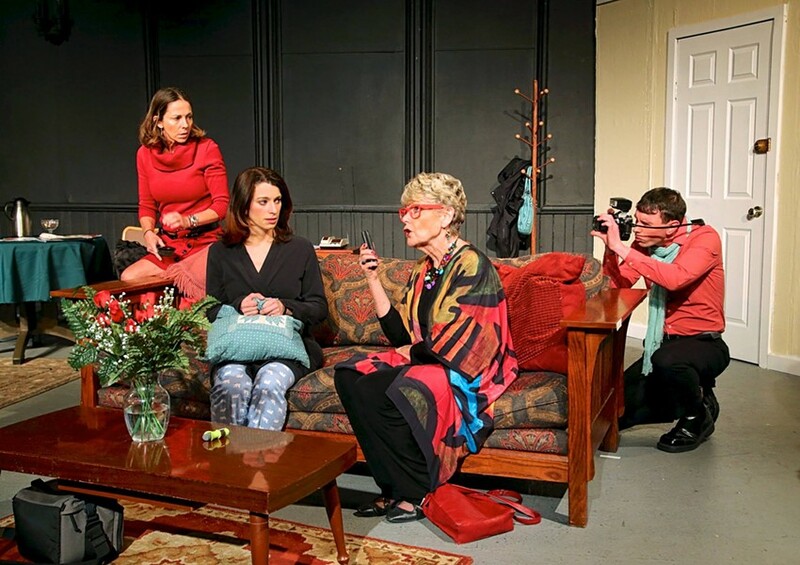 While last week's brutal weather almost certainly had an impact on rehearsals leading up to "Sketching the Soul," it feels as though the director and some of the cast could have used more time to get to know the characters they were playing. Perhaps by the second weekend, that will be resolved. Theater Theater Review Sketching the Soul Don Bartalo Hummingbird Theater Co.